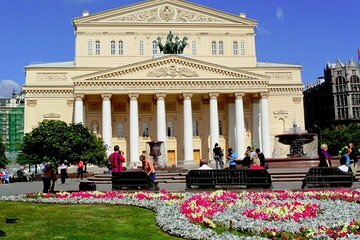 Enjoy exclusive backstage access to one of Moscow's most legendary attractions: the historic Bolshoi Theatre. Explore this recently renovated landmark on a guided tour, including numerous areas that are typically off-limits to visitors. Bask in the 18th-century theatre's exquisite beauty, history and current role as home to both the Bolshoi Ballet and the Bolshoi Opera. In fact, the theatre's neoclassical facade is also so well known it appears on the country's 100-ruble.